Last semester (semester one, 2009) I created a series of concertina books that each formed a portrait of one (or two) of my house mates. The drawings in each book explored not only images of the person, but of things and colours that I associated with them. You may be wondering, why concertina books? Good question, and there are a number of reasons. One of them was that I wanted to create something with a sequential narrative in it. Another is the interesting sculptural element that the books create - I originally displayed Mia with the pages tumbling out, suspended in mid air with the front fixed to the wall and the back resting on a table, and the dream sequence of Meg folds out in a spiral. The textiles dimension to the works is also a fun bonus for me, the choices of which tie in conceptually with the first two portraits. 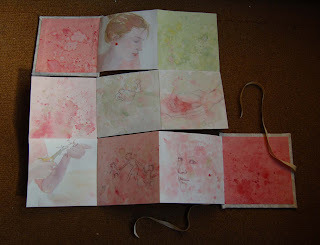 This second one is of Meg (using water colour pencils - the cover is a pair of old jeans I owned). Unfortunately though, I was working in pencils and the drawings have come up quite faint in these photos. This video shows the progression of a third book, called, Ivy's leaving: a conversation in the kitchen, and is a dual portrait, recording a conversation between Ivy and Karis about two weeks before she moved out (drawn in conté crayons). The topic? her departure.